Finally Google reveals the name of Android L ( version 5.0). 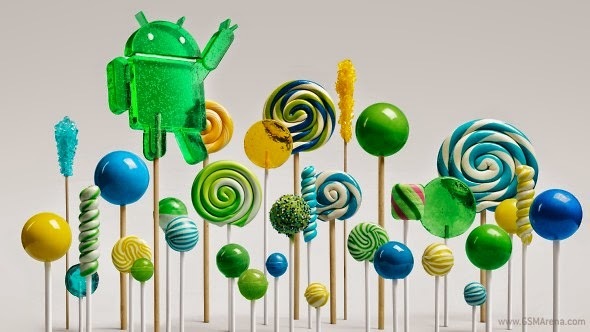 The official name of Android 5.0 will be Android Lollipop and code name will be Android L.
Android Lollipop may come with Nexus devices soon ( Nexus 9 is just announced). But tech world is hoping that, Will get V 5.0 for nexus devices and Motorola devices. Android added 68+ languages additional with this new update. Another update from 5.0 is logic intelligent network connection which means, Wifi will only get connected if there is a verified internet connection on that wifi network. Bluetooth connectivity has been updated with power efficient bluetooth nearby scanning. Also Android says that, 4 x performance is guaranteed with new version.Support 64 bit devices ( Nexus 9 will be 64 bit) which brings desktop class CPU and graphics to Mobile phones. Google also announces touch-less control operations (which is presently available at Moto X and Nexus) with the phrase "OK Google". But it will not be exactly touchless control as in Moto and Nexus devices.